In large environments with different Forefront TMG Administrators it may be helpful to let Administrators access the Forefront TMG Management Console remotely via RDP or the TMG MMC installed locally on the client machine. 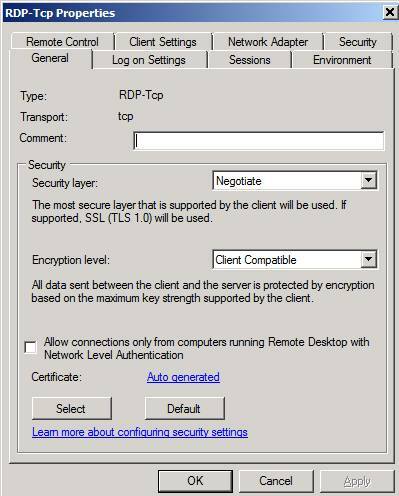 If you want to use the Remote Desktop protocol (RDP), you must first enable RDP on the Forefront TMG Server and specify the encryption level. For security reasons you should also enable NLA (Network Level Authentication). Ideally, you should use a certificate issued from an internal Certification Authority to avoid certificate name and trust warnings as shown below. Some Administrators want to publish an internal RDP Server on the TMG Server. If you want to do this you must reconfigure the RDP connection to listen only on the internal network adapter of the TMG Server. The Listener created by the Server publishing rule will listen on the external adapter and if you don’t change the RDP settings you will get a socket pooling conflict. 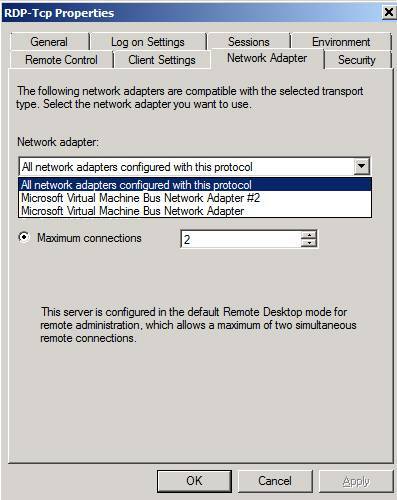 To change the settings navigate to the Network adapter settings in the RDP-TCP properties and change the RDP listener to the internal network adapter. Next, you must allow the Administrator or required users to access the TMG Server via RDP. 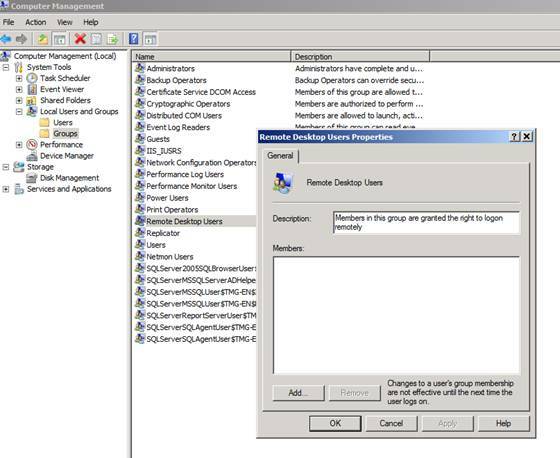 The best way is to put the users / user groups into the local Remote Desktop users group in the local account database on the TMG Server. Now that the users have access to the TMG Server computer you must give the users the necessary rights for TMG Server administration. 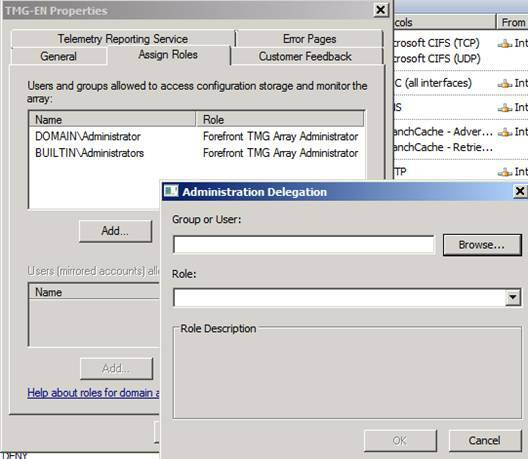 Forefront TMG Standard and Enterprise come with a simple role concept which grants users different rights to the Forefront TMG configuration as shown in the following screenshot. The last step is to change the System Policy rule settings to allow the computers to access the Forefront TMG Server. 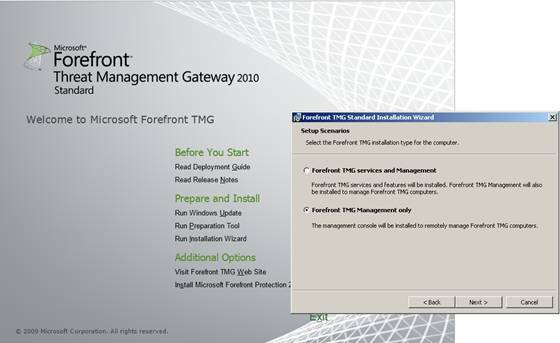 Forefront TMG Server protects the system for accessing from the internal network. To allow the computers to access the TMG Server start the TMG server and navigate to the Firewall Policy node – All Tasks – System Policy – Edit System Policy and put the computers to the Remote Management Computers set. If you want to access the Forefront TMG Server remotely via WMI (Windows Management Instrumentation), you must configure some additional settings on the Forefront TMG Server. 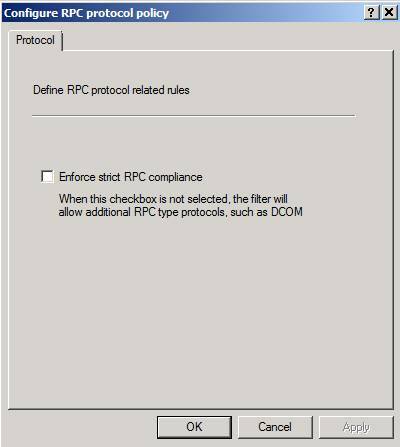 First you must disable the “Enforce Strict RPC compliance” setting in the System Policy rule set for Active Directory access or if you created a dedicated Firewall Policy rule set which allows the RPC protocol from the client machines to the LocalHost you must disable the “Enforce Strict RPC compliance” in the Firewall Policy rule. To do so, right click the Firewall Policy rule and select the RPC setting. In many scenarios, disabling the Strict RPC compliance is not sufficient. 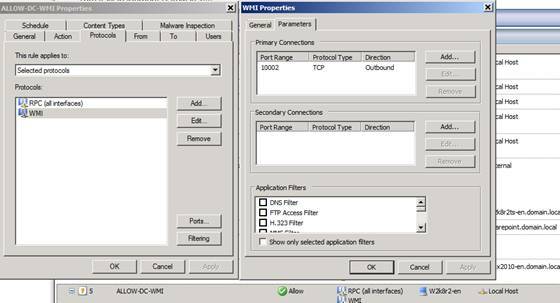 In the following screenshot I created a Firewall Policy rule for WMI access on port 10002 to access the TMG Server using a remote WMI tool called PRTG, with a special implementation from the Paessler company. 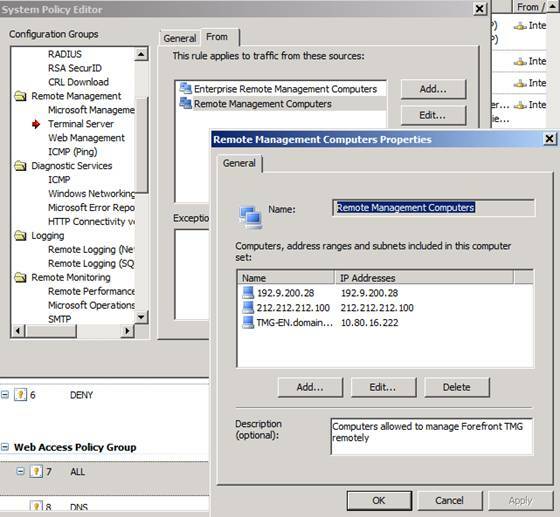 For different applications accessing the Forefront TMG Server via WMI, it might be necessary to create Firewall Policy rules with different Ports or Port ranges. It is possible to install the TMG MMC on a local Windows client machine to access the TMG Server remotely. Insert the TMG DVD on the local machine and install only the Forefront TMG Management console component. Please keep in mind that you must apply the same TMG Service Packs and Rollups on the clients which are installed on the Forefront TMG Server. In this article we talked about the different concepts to access a Forefront TMG Server from a remote workstation via a Remote Desktop connection or a local installed Microsoft Forefront TMG Management console.